The table was littered with the belongings of all 6 of us. Dads computer. Zach's Geometry. Peyton's quarter collections. Keaton's art supplies. Molly's clothes. My dirty dishes. The table seems to be Grand Central Station in our home. 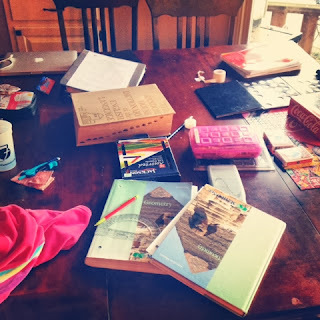 Its doesn't matter that we have a schoolroom upstairs to house the piles of books and papers. We all end up at the table together. A sweet but messy situation. The bathrooms are screaming for disinfectant. The laundry has formed giant mountains. asking me whats for dinner. to give attention to our home. kids. To connect with each heart. on the same page with them. to them for unloading conversation. a bit of their hearts. start talking to your kids! Especially those tween and teen aged ones. that is easy to grant! to tell me that I don't know about?" to bring up on their own. went with your friends this week!" Sometimes hours worth of stories. in the relationships you have with your kids. Start by giving them the gift of your time.